This is a defens game in which you will be in the army of King Denas. He has summoned you to help in key locations around the kingdom as we are under heavy attack. There are certain paths that you must defend so the enemies cant pass through. Build barracks near the road to spawn soldiers and try to defeat the golbins and other enemies, but if that is not enough you can also get help from an archery tower which will shoot enemies constantly with arrows, a magic tower that will cast spells at enemies that ignore their armors and even some dwarven towers that will blast cannonballs on top of the enemies within range. Try to place them in key locations and also keep in mind that you can rally the support units whenever you want, and you can also use the prayers to call upon the divine flame which will deal lots of magic damage in a certain area. Use the mouse to place towers and use your powers. 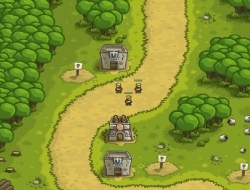 Kingdom Rush 10.00 between 0 and 10 based on 1 votes.